Clogged sewers, leaking faucets and blocked or overflowing septic tanks are serious plumbing issues. They can not just make your house look old and unmaintained, but also increase the repair bill if you do not take care of them in time. In such cases, your best hope is a professional plumber. But, how do you select a plumber from the long list of plumbers, all of them claiming to provide the best plumbing, drain cleaning and septic services. How can you know whether they have the skills to solve your plumbing issues correctly the first time? Your best bet is a plumbing and drain cleaning service that is trusted by others, and is fully recommended. 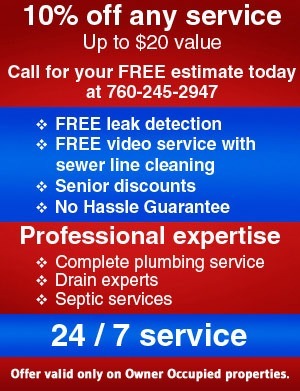 Trust Roto-Rooter Plumbing and Drain Service of the High Desert, thousands in Victorville and Lancaster have! 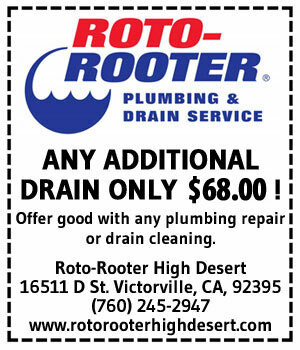 Roto-Rooter is Victorville’s and Lancaster’s resident plumbing and drain cleaning expert. Whether it is residential plumbing, commercial plumbing, drain cleaning, septic service- repair, maintenance or installation, we can help out. Just call us, tell us your problem and we will quickly send over our best plumbing professionals to come to your home or workplace. They will analyze the problem, consider various alternatives, discuss them with you and choose the optimum solution (according to your budget and the alternatives available) for the issue at hand. The issue will be tackled skillfully and quickly, putting you to minimum inconvenience. To learn more about our residential and commercial plumbing, drain cleaning and septic services, please contact Roto-Rooter at (760) 245-2947. Your call will be answered by a live customer service agent.